Roatán is one of the Honduras Bay Islands in the Caribbean Sea. The island of Roatan is located 30 miles off the north coast of Honduras atop the worlds second largest coral reef. The reef attracts many fish, and is world known for scuba diving. Roatan is the largest of the Bay Islands at about 77 kilometres (48 mi) long, and less than 8 kilometres (5.0 mi) at its widest. The island has a number of beaches, all of which are public. 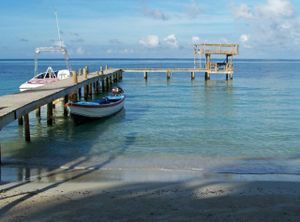 Originally an English colony, and later ceded to Honduras, Roatan has a mixture of english and spanish speaking natives. With two cruise ship ports, Roatan has become a cruise destination, and roads and beaches can be busy when ships are in port. Prices for services may be higher when a ship is in. In recent years the island has experienced a lot of development and has a number of resorts along with more rustic accommodation as well. The western side of the island is the most populated and where most tourists stay, and the eastern side is more remote and isolated. Roatan has a warm climate with daytime temperatures between 80-90 year round. West Bay - is the furthest-west area of the island, has some good restaurants and places to stay, and several large resorts have been built on the beach. It's arguably the best stretch of beach in the western portion of the island - powder-white sand that is very well maintained. The reef is a short swim away for excellent snorkeling, especially near the west-most tip, also known as Tabyana Beach. West Bay is also home to some of the best sunsets. It is recommended to spend beach time in the West Bay and bar time in the West End. West End - has some good restaurants and places to stay, and it is definitely the most fun town on the island. There are bars, restaurants, live music, right on the Caribbean. The are also a multitude of dive shops, if you are interested in learning to dive, or would like to do some fun dives as a certified diver. Sandy Bay- a mostly residential area, Sandy Bay also has a few resorts, such as Anthony's Key Resort, where you can swim with dolphins, as well as a hostel, Roatan Backpackers' Hostel. There are also a few restaurants such as The Blue Parrot, The Beach Grill at Blue Bahia, and Tranquil Seas. Octopus Divers is in Sandy Bay, if you're staying in the area and would like to do diving. The Carambola Gardens is located in Sandy Bay as well. If you are interested in doing volunteer work on the island, there are several non-profits in Sandy Bay, such as Clinica Esperanza, Care4Communities, and the SandCastle Library. The Sandy Bay beach gives easy access to beautiful snorkeling, which is about a 200 meter swim from shore. Coxen Hole - is where the airport is located, and most of life's necessities can be found here, including stores, restaurants, and banks. French Harbor - has some good restaurants and resorts and most tourists do not venture further east than French Harbor, which is at roughly the mid point of the island. Past this point are a few newer beach resorts, resort communities, and some private towns with beaches and resorts. Many of the resorts, restaurants and bars on this part of the island were in the past a secret of locals and expats but with the west end becoming more crowded the secret is out and more tourist are finding their way to the east end of the island. One point of interest would be Jonesville and the infamous Hole in the Wall restaurant reached by taking a small water taxi from Jonesville to reach it. Another is Camp Bay Beach Adventure Lodge and the Tasty Tarpon Restaurant located on Camp Bay Beach the largest of all the beaches of the Bay Islands and can be accessed by car or boat. 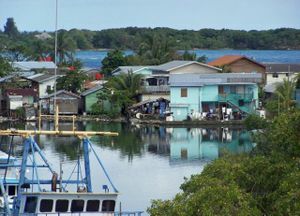 Punta Gorda - Fishing community of the Garifuna. Oak Ridge Fishing community with few roads, and buildings on stilts over the water. Camp Bay - is a further on from Oak Ridge about 4.5 miles and home to the largest natural beach on all the Bay Islands - Camp Bay Beach, which you can gain free access to at a couple different locations and has a small beachfront resort and restaurant: Camp Bay Beach Adventure Lodge. Camp Bay is about the furthest you can go in a car. Past Camp Bay are the mangroves which are quite beautiful when navigated by boat and kayak. There are many tours through the mangroves which can be chartered from various points on the island. Juan Manuel Gálvez International Airport (Aeropuerto Internacional Juan Manuel Gálvez) (IATA: RTB, ICAO: MHRO) is on the island of Roatán. Several US airlines offer non-stop flights to Roatan on weekends. American Airlines, flies non-stop from Miami (Wednesdays and Saturdays only) and Dallas (Saturdays only). United Airlines, offers direct flights from Houston (Daily during high season, less often other times), and from Newark (weekend). Delta Airlines, flies non-stop from Atlanta (Saturdays only). American, Delta and Continental offer flights to San Pedro Sula's's Ramón Villeda Morales International Airport (Aeropuerto Internacional Ramón Villeda Morales) (IATA:SAP, ICAO:MHLM), also known as La Mesa International Airport situated on the mainland, from which you can then get connecting services to Roatan. Avianca, a group of five regional airlines, offers service from Miami, Orlando, Chicago, Dallas, Toronto, Houston, New York, Los Angeles, San Francisco and Washington DC with connecting service to Roatan, including mid-week flights, plus flights from elsewhere in Central America. The island is visited by a number of cruise lines, such as Carnival, Princess, Royal Caribbean, and Norwegian Cruise Lines. There are two cruise ship ports, Port of Roatan in Coxen Hole, and Mahogany Bay outside of French Harbor. Mahogany Bay has an onsite beach, shops, and activities such as zipline, so cruise visitors don't have to experience the rest of the island. The beach is nice and the setting amazingly surreal, with 2 rusting shipwrecks within view. Cruises also port in Coxen Hole. The Galaxy Wave  is a modern catamaran ferry that travels to/from the Muelle de Cabotaje port in La Ceiba, east of the city centre on the Honduras Mainland; Galaxy Wave is currently (June '15) the only ferry option to Roatan. The ferry is fast, clean, comfortable, and reliable. It departs from La Ceiba twice daily, once in the morning at 09:30 and once in the afternoon at 16:30. Departure times from Dixon Cove, Roatan are at 07:00 and 14:00. The journey lasts about 70 minutes. As of June 2015 the regular-class cost is 729 Lempiras (33.50 USD) from La Ceiba to Roatan and 705 Lempiras (32.40 USD) from Roatan to La Ceiba; there is no discount for buying a return and prices reflect a 13.5% price increase from the year before. The former catamaran service by Captain Vern that provided direct ferry service between West End, Roatan and Utila is no longer operating. The Utila Dream now provides ferry services between Roatan to Utila once a day at 10:45am on Fridays, Saturdays and Sundays. Afternoon boats can be more rough due to stronger winds. Make sure to take some travel sickness pills if you are unsure how you will react. The trip from La Ceiba to Roatan can be rougher than the return trip, some locals fly from the mainland to Roatan, but will take the ferry from the island to the mainland. Another option is to charter a boat from one of the locals. Normally the best way to go about this is to approach one of the dive schools as they normally aren't using their boats in the afternoons. Find other travellers who want to do the same and go in a group of 4 or 6. Roatán has a system of paved roads connecting the most important communities of the Island. From the Western End of the Island, at the community of West Bay, the road leads through West End, Sandy Bay, Coxen Hole, Brick Bay, Mount Pleasant, French Harbour and Oakridge - Punta Gorda after which it becomes a dirt road and continues east for a distance, to the area of Paya Bay, Camp Bay, Port Royal, and other eastern communities. Buses run every 15 min between Coxen Hole and West End during the day. They depart from opposite the market in Coxan Hole. Buses run every hour to Oak Ridge, stopping at the new ferry terminal and passing through French Harbour, Polly Tilly Bight, and Punta Gorda on the way. These buses leave from opposite the HB Warren supermarket in Coxen Hole. There are hundreds of taxis and they can be bargained with. But ask the price in advance and if it seems high, ask another. Even if you agree on the price make sure you have the exact amount of the fare as some corrupt taxi drivers do not give back your change. Many taxies are "colectivo" or shared and will be stopping along the way. Prices from the airport are fixed during the day and negotiable at night. A cab from the airport to West Bay is US$25. Tipping is not expected by drivers. If you are looking for contact details for a reputable taxi driver during your stay, the roatan taxi directory is a community contributed list of drivers with ratings from other travelers. Taking a taxi with a reliable driver is highly recommended. There are water taxis during daylight that link West Bay and West End for US$3 per person 1 way. Wait on the end of a dock, and flag them down. Renting scooters is an efficient way to see different areas of the island. The rental agencies will happily provide you with detailed maps and explanations on how to best see the island. Scooter rentals can be found on the main road in West End and West Bay. The daily rent is between USD25-35. As a guarantee against accidents agencies will want to swipe your credit card. Be careful as the roads have no shoulder and local drivers stop in the middle of the road, and may pass on curves. Expect poor road quality with potholes. Speed bumpers are also abound. Multiple rental places like avis (west bay), econo (Airport) and Roatan Sales and rentals (west end) are available in the island, prices may vary from 40USD to 75USD (Daily and depending of the type of the car) take into consideration that most places ask for a security deposit (Econo charges 1200USD). The island can be explore in one day in a 2 hour drive. Some places offers a driver too. English is widely spoken, especially in the West End and West Bay communities and is the native language of many Roatanians of British and African descent (except for the Garifuna). Spanish is spoken natively by most residents and is the second language of many of the native English speakers. Spanish is the official language of Honduras and as such is the primary language of the school system. Garifuna is spoken by the Garifuna people who are descendants of the Kalipuna peoples of St. Vincent. There is also 'Island Talk' spoken by the native Caribbean people. Many individuals living on Roatan are bilingual (English/Spanish). Caves of Helene, explore the caves. Dolphin show, at Anthony's Key Resort. East end, if you are up for an adventure, visit the east end of the island past Oak Ridge to Camp Bay Beach the largest of all the Bay Island beaches. The road changes from pavement to dirt/gravel mix and continues on to Punta Blanca and Camp Bay. A 4x4 vehicle is not required for the journey and you'll see many driving compact cars and scooters. This end of the island is home to many locals and some expats as well as a few resorts, one that needs to be mentioned is Camp Bay Beach Beach Adventure Lodge wich is the only resort on Camp Bay Beach. It is also the home of the Tasty Tarpon restaurant and a place to gain free access to the beach with free parking and a depot for your east end adventure from snorkeling/ diving to fly fishing and Mangrove Forest boat or kayak tours. There are a few other interesting stops along the way such as Marble Hill Farms where wonderful local jams & jellies are made. Asylum bar & grill is on a palapa literally over the calm waters in Camp Bay which can sometimes feel like the restaurant at the end of the universe after the long journey of getting there. Luckily these places always have beer on ice and grilled food which makes the trip worth it. If you're looking to get off the beaten path and out of the tourist ridden West End, this is it. Santa Helena located in Roatans municipal of Santos Guardiola, is a small secluded island 12 miles further east of Roatan. This off 'the beaten path' beautiful tropical paradise is a one mile by two mile island that is sparsely populated with indigenous people that still live life as it was in the 'Old Caribbean', unspoiled and uncommercialized from tourist related development, without electricity or government subsidised infrastructure. St. Helene is the epitome of a 'sleepy little fishing village'. Access to Helene is by private boat or passenger ferry service from Oak Ridge. Iguana Farm, near French Harbor. Marine Science Museum, at Anthony's Key Resort. Oak Ridge, is a small village on the eastern end of the island. On arrival, you'll be offered water-taxi tours to the Hole-in-the-Wall restaurant, neighbouring communities, and around the harbour, but it's also pleasant to walk through the village, which has many brightly coloured wooden houses on stilts along the shore. Pigeon Cayes, Two small deserted islands. Punta Gorda, renting a scooter and driving to Punta Gorda takes about 1 hr each way, and goes through some beautiful countryside. It can be nice to get away from the touristy areas and get back into places that look and feel like Honduras. The town of Punta Gorda is friendly and you may run into a beach party if you are lucky. Whites Beach, is supposed to be beautiful. Roatan is known for its Scuba Diving. There are many dive shops all over the island, but the majority are located on the west side. The fishing is good just off the reef in Roatan. Marlin, Barricuda, Tuna, Wahoo, Mahi Mahi, and much more can be caught in these waters. If you are a good swimmer, and keep an eye out for motorboats, you can swim straight out from west end towards the white buoys for about 200 m, you will arrive at a 10-30 ft deep reef that is great for snorkeling and freediving. Slightly further out the reef gets much deeper and you hit the wall. You can walk along the beach to West Bay from West End in about 45 min, and can take a water taxi back if you like. They seem to stop running around sunset unfortunately, so make sure to catch them before it is too late. Parts of this walk are remote, so it's best to travel in a group. Shirkie's Barrio Dorcas Ranch,  Horseback riding on the beach at West End. Kayak trips around the Island and through the mangroves on the east end of the island. Black Pearl Golf Course, 18 hole golf course designed by Pete Dye. The local currency is the Lempira, but US dollars are accepted in almost all shops and restaurants, however, your change is mostly given in Honduran Lempiras, and the exchange rate varies from in each shop. Local handicrafts abound and can be had for very little money. Look for Central American arts and crafts, brightly-painted pottery, wood carvings, costume jewelry, tee-shirts, cigars and clothing. Remember that the asking price should only be considered a jumping-off point for some downward haggling. It's expected and if you have the stomach for it, you'll likely end up with a final price somewhere around 40-50% lower. West End has many gift shops. There are many tourist shops where you can buy t-shirts, hats, swim-ware, etc. If you're in West Bay, there are also shopping options available. There are many great places to eat on Roatan, with the highest concentration of restaurants located in West End and West Bay. You can find traditional island food as well as delicious "north american" offerings, and seafood abounds - you can find top quality lobster for dinner for around US$15. Gio's, French Harbor. One of the nicer dining experiences on the island. It's a longtime mainstay for expats and islanders who can afford to dine out. Seafood is the specialty of course. Roatan boasts a wide array of experiences for night life depending on your taste. Since the arrival of cruise ships, prices have risen somewhat and restaurants and bars cater to cruise passengers as well as North American and European tourists. These types of establishments are relatively easy to find as they are mostly located in and around the West End. Prices here are generally higher than in most other places on the island. The best part about drinking in the west end is the pub crawl that occurs almost every night. Its virtually mandatory to start at Sundowners and enjoy drinks whilst watching the sun go down over the beautiful bay in front. When Sundowners shuts at 10PM the whole bar shifts about 50 m down the street to kick on at the Purple Turtle where you can enjoy live music out the back. The Purple Turtle closes at midnight and from here most people continue on to the Nova Bar or the Twisted Toucan's will be the joint to party at and where you will meet most of the locals in the region this being a favorite haunt. Most people go home from here but if you really are feeling like an adventure grab a group of friends and head down the beach to FuBar. There are excellent accommodations ranging from US$4-$400 per night. Condos are available as are beach cabanas. Bananarama , Clean bungalows on a beautiful beach, free use of kayaks, restaurant, breakfast is included. Coconut Tree Hotel, . Great accommodations for travelers on a budget. All cabins have A/C and a refrigerator. Cabins in Westend and Westbay. Dorms available to Coconut Tree Divers  customers. Remember, although Roatan is away from the security problems central america and mainland Honduras have, you should take precautions. Use common sense in the busier areas of the island. In Coxen Hole and French Harbour be extra careful specially at night and try not to travel late by yourself but rather with hotel transportation or a local from the island in who you can trust. Keep exact change (some restaraunts and taxi drivers may "Not have" enough change). During hurricane season and strong storms is NOT recommended to travel by boat or swim. The naval forces in Honduras will alert the island about these seasons and you should take the necessary precautions. This page was last edited on 27 February 2019, at 08:32.